An alcohol free hydrating toner that cleanses, refreshes and soothes your skin. Before I begin please note that this is my 1st toner and I have nothing to compare it to other than the astringent used in Salons after threading. So I have just honestly put down what I felt while using this product. Texture: Clear liquid just like water. Fragrance: Mild medicinal fragrance not so appealing to me. I am really not sure if this is what a Lavender smells like. Package: Sturdy, simple and neat. Taste: Bitter. Didn't taste it on purpose :P . Happen to taste it around the lips when I had breakfast immediately after toning. Refreshing: Not refreshing. May be owing to its non-alcoholic property it didn't provide the cooling effect as provided by an astringent used in Salons. Soothing: No burning sensation and is moisturising. Tightening: Nil. 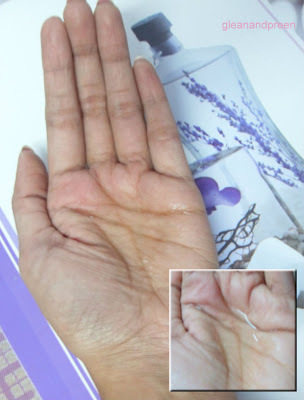 Just take some water and a tiny drop of oil and apply it to face. That's the only feeling I got after using this. Beware I got a mild rash on cheeks after 2 3 days of use. Initially I couldn't figure out as I have changed almost many of my skin care products. But after experimenting with each of the product I finally figured that this is the culprit. Ingredients: Purified Water, Propylene Glycol, Polysorbate 20, Phenoxyethanol, Lavender Essential Oil.